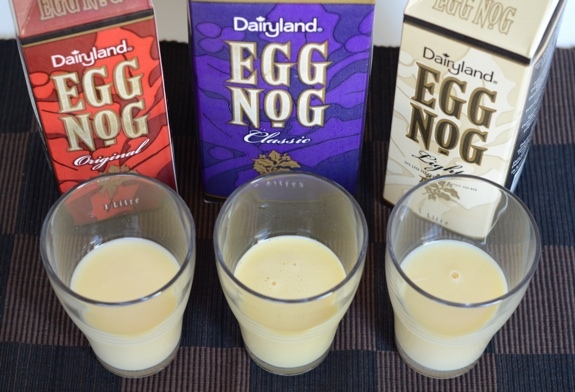 Dairyland egg nogs, from Original to Classic to Light. Confused? Let us guide you. I’ve often been baffled by hair spray naming conventions. Instead of a nice linear sequence – 1, 2, 3, 4, 5, say – the choices usually amount to the following: extra hold, maximum hold, ultra hold, mega hold, doubleplus hold. Which one’s hold is the strongest? Which one is least likely to leave someone’s hair limp and floppy on retro ’80s night? Oddly, the seasonal world of egg nog isn’t all that different. In this corner of Canada, Dairyland brand egg nog comes in three distinct varieties: Classic, Original, and Light. Light is fairly self-explanatory, but what about the other two? How can Classic out-classic Original? Isn’t being the Original the first step to becoming a Classic? In the context of egg nog, aren’t they technically the same thing? A call to Dairyland customer service set me straight. Apparently, it all comes down to the milk fat. But I couldn’t leave it at that. I had to test and compare all three. So here, for your benefit, is my analysis. 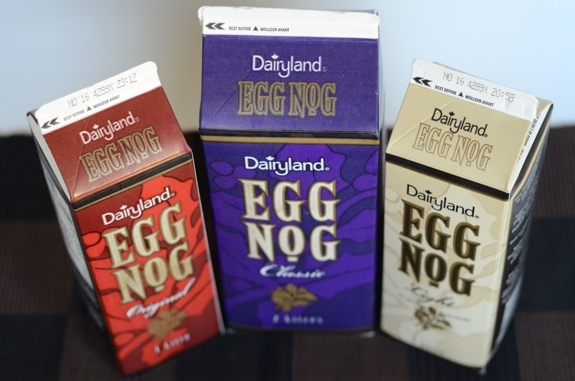 Dairyland egg nogs, from left: Original, Classic, Light. Let the testing begin. Classic (Purple Carton): So thick, it’s somewhere between a liquid and a solid. Buttery milk and nutmug dominate, with a whole lot of sweetness. It’s like drinking from a carton of sweetened, spiced half-and-half. (I’ve never done this. I’m only guessing.) Large bits of spice stay in suspension. Think melted ice cream. Original (Red Carton): More nutmeggy and spicy than Classic, with a little bit of pepper, and maybe some mint. You can still taste butter, but the spicing is more front-and-centre. Less thick than Classic, but not by a lot. I like this one best. Light (Beige Carton): A bit thinner than the others. Sorry to say, but you can taste earth in the glass. Not earth as in earthy, but earth as in dirt. More sweet than creamy. Sipping between Classic and Light reveals how wide the gap is between the two. So there you have it. Conclusive results. If I had to pick just one, I’d go for the Original. It’s the best tasting, and it’s the middle-of-the-road choice, calorie-wise. Classic comes in second, and Light takes third place. Each glass is filled with roughly half a cup of egg nog. That's the serving size. Yikes. Value for cash money: More than milk, but not crazy expensive. You’re not going to use it for your breakfast cereal, are you? Availability: As of early November, it’s already in the wild. I imagine it’ll be around until just after Christmas. Nutrition? : Per 125 ml: 150 calories for Classic, 120 calories for Original, and 110 calories for Light. Nutritional info is nearly the same for all three — the only real variation is fat content (and cholesterol). The Classic has 5 g of fat per 125 ml, the Original has 2 g, and the Light has 1.5 g. In truth, I was expecting the light to be a whole lot lighter. Windows of Availability: Before I started writing this comparison, I had no idea that there were two distinct windows of availability for egg nog in Canada. The first window starts a couple weeks before Canadian Thanksgiving in October. After that, egg nog vanishes again until early November. So now you know. The verdict: Go for Original. It also makes a great egg nog latte. COMING ON WEDNESDAY! Part 2 of our egg nog food fight! Soy egg nog (a.k.a. 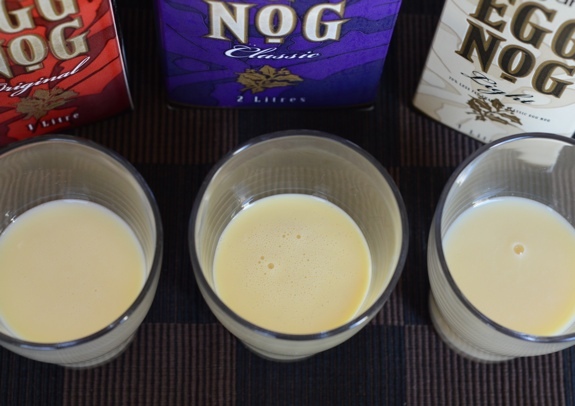 So Nice Noel Nog) vs. Dairyland Original egg nog. Don’t miss it! 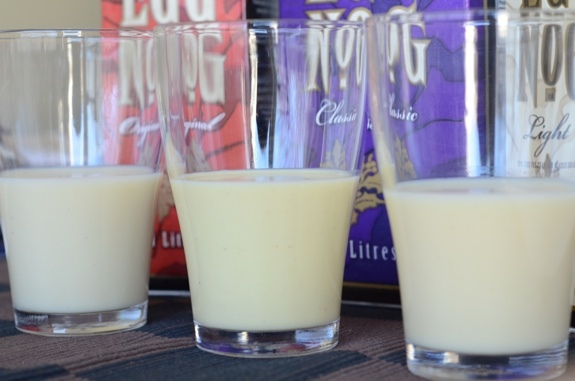 Light eggnog is like decaf coffee or non-alcoholic beer. What’s the point? I’m drinking nog for its creamy, fatty goodness, not it’s caloric content. That said, Original looks like the clear winner here — I’ll keep it in mind at the Safeway! I’m looking for a picture of the old bordens egg nog cartons from the 80’s. With the cartoon cows on it. Classic wins unanimously in my house. Original is just a little too sweet and spicy, but it’s not so bad that I’ll throw it away! Maybe I’ll mix the two. I love rum & egg nog with a little fresh grated nutmeg on top…. so good when decorating the Christmas tree, listening to Bing Crosby…. glad to see I’m not alone in enjoying the nog! Thanks! Glad you found it useful! It was admittedly fun to research.